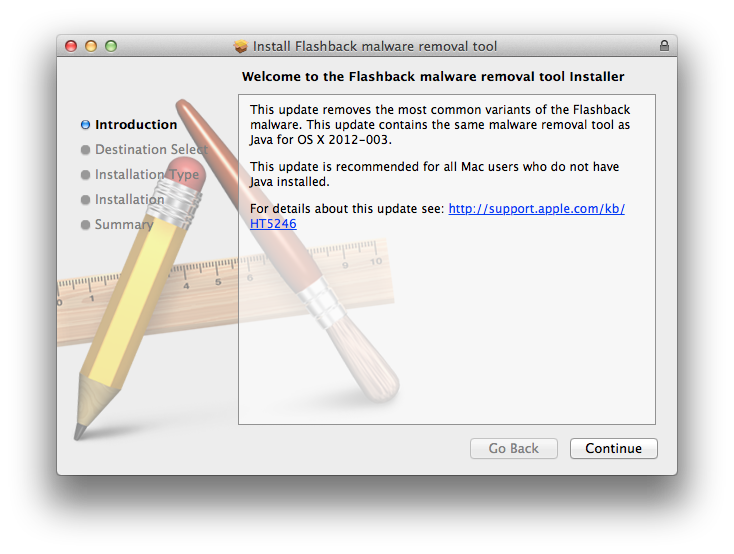 Coming on the heels of its Thursday Java update, Apple has released a separate program to remove the so-called Flashback trojan that has affected over 600,000 Macs worldwide. Apple on Friday released version 1.0 of its "Flashback malware removal tool" which will scan a user's computer and erase known iterations of the trojan that some are calling the worst the Mac platform has ever seen. The standalone program is meant to be used by Mac users who don't have Java already installed on their machines and includes the same code as yesterday's software update that plugged a security hole which allowed the malware to automatically install itself without admin authorization. This Flashback malware removal tool that will remove the most common variants of the Flashback malware. At one point, a reported 600,000 Macs worldwide were part of the Flashback botnet, which harvested personal information and web browsing logs from affected machines. Apple was slow to release a patch for the exploit, but managed to roll out two updates within the past week. The notorious trojan was first discovered last year by a security firm, tricking users into installing it under the guise of an Adobe Flash installer. The most recent version bypasses any user action and automatically installs itself after an affected website is visited. Apple's Flashback removal tool comes in at 356KB and can be downloaded here. In order to use the software, a user's Mac must be running OS X Lion without Java installed.